Be the first to share your favorite memory, photo or story of Doris "Dotsie". This memorial page is dedicated for family, friends and future generations to celebrate the life of their loved one. 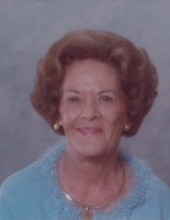 On April 6, 2019, Doris “Dotsie” Carter Wallace, went to heaven to be with her Lord, husband and eldest son. She was born December 10, 1924 in Gaston County, a daughter of the late Willis C. and Carrie Traxler Carter. A Gastonia native and graduate of Ashley High School, Dotsie was married to the love of her life, Jim “Legs” Wallace for 56 years. Known for her zest for life and humor, Dotsie worked as a freelance model and accompanied Legs all around the country traveling for business and volunteering for the VFW as well as helping political candidates get elected. Jim, in charge of lavish parties and conventions for Provident Life Insurance, would frequent places like Miami, The Greenbriar and The Homestead with his belle of the ball, Dotsie, and she enjoyed every minute. Time at home while raising their children, Jimmy Jr., Dan and Sha, would be filled with nights at The Eagles Club, The Red Fez Club and boating on Lake Wylie. Following Jim’s death in 1998, Dotsie began traveling with her son Jimmy Jr., a retired Raleigh based attorney. They visited places like Canada, Spain, England, France, Greece, Italy, Turkey, Ireland and New York where they delighted in seeing Broadway musicals. When she was nearing 80 years old, Dotsie discovered Arthur Murray Dance Studio and went on to earn 8 gold medals in ballroom dancing along with a favorite memory of her dance group performing on the Carnival Cruise Ship for the passengers. Her later years were spent eating at Georgio’s Restaurant with her niece, Nancy, and her new friends, Joe and Robin. As well as traveling to the beach and mountains with Dan and Sha’s families, attending Panthers games and visiting her grandchildren at their colleges and delighting in their new careers. In September of 2016, she moved to Covenant Village, where she reunited with longtime friends and made a new buddy, Carolyn. Among one of her highlights during this time of her life was being able to star in several student films that her granddaughter made, including one that was screened in a Mississippi film festival where Dotsie not only got a standing ovation, but people stood in line to get her autograph and to take pictures with her. At 94, Dotsie held faith, family and her love of laughter dear to her. She leaves behind amazing memories for those who loved her including her son, Dan Wallace and wife, Kim, daughter Sha Tate and husband Allen, her grandchildren, Brian and Allison Wallace and Allen and Carter Tate, nieces Nancy Smith, Ann Baxter, Susie Rhyne and Susie Wallace; nephews, Dan Carter, Greg Carter, George Carter and Jimmy Carrie. In addition to her parents, she was preceded in death by her husband, James “Legs” M. Wallace, her son, James M. Wallace, Jr., her brothers, Ernest, Nook and Wilbur Carter and her sister, Catherine “Cat” Gregory. The family will receive friends at Covenant Village on Saturday, April 13, 2019 from 2:00-4:00 pm and also from 2:00-3:00 pm, Sunday, April 14, 2019 at McLean Funeral Directors of Gastonia. A funeral service will be held at 3:00 pm, Sunday, April 14, 2019 at McLean Funeral Directors of Gastonia. The family would like to thank the wonderful caregivers at Covenant Village in the Arbor Wing and also Gaston Hospice and Runa Tolbert who took very special care of Ms. Wallace. Memorials can be made to the Gaston Hospice, P.O. Box 3984, Gastonia, NC 28054. To send flowers or a remembrance gift to the family of Doris "Dotsie" Carter Wallace, please visit our Tribute Store. "Email Address" would like to share the life celebration of Doris "Dotsie" Carter Wallace. Click on the "link" to go to share a favorite memory or leave a condolence message for the family.